What Can Redlands Lock & Key do for You? When it comes to choosing a locksmith, most people don’t have a company that they can, by memory, call when they are having an issue. For the most part, a locksmith is only called when there is an immediate issue such as being unable to enter a locked home or vehicle, however, we wanted to take some time in today’s post to go over exactly why Colton area residents should choose us as their locksmith when they are experiencing any issues related to the realm of locksmithing. We hope that by the end of this post you understand why we have been chosen time and time again as the best locksmith in the area. Continue reading below to learn more. What Locksmith Services do we Provide? In order to be a top tier locksmith company, we have taken time over the years to develop a wide range of services that we are able to provide to our customers. Below, we have listed just a few of our services. Transponder Key Replacement: If you own a vehicle that was manufactured after 1995, chances are that you own a transponder key. Unlike traditional keys, transponder keys contain a small chip in the head of the key that makes it possible for the key to start the vehicle. While this has greatly increased the security for vehicles, it also means that a person cannot simply have a new key recut without first programming a new chip to “talk” to the vehicle’s ignition system. 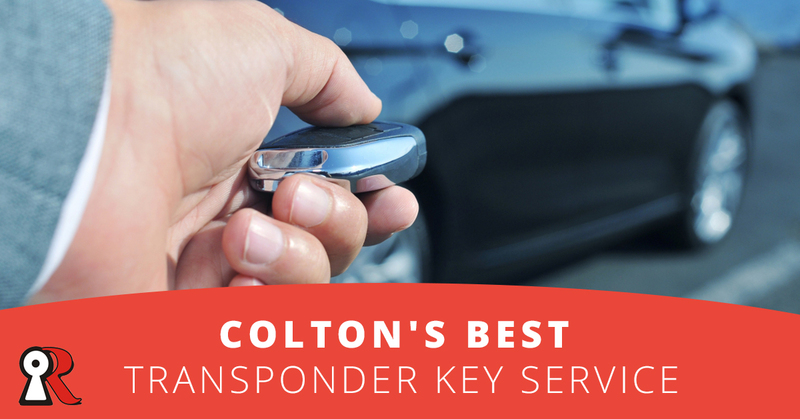 Luckily, we here at Redlands Lock & Key are fully equipped to replace transponder keys for Colton are clients. Residential Locksmith: Nothing is worse than coming home only to realize that you have either left your keys inside and locked the door or have somehow misplaced your key during your time away from home. Fortunately, we are able to come to your home and help you get back in fast. With one call, we will send out one of our locksmith specialists to get you back in your home as fast as possible. Mobile Locksmith: Locked out of your car? No problem. With our mobile locksmith services, we are able to come to you and help you get back into your vehicle fast. Using the latest technology, we will make sure that no damage is done to your vehicle when trying to unlock it and we’ll make sure that we answer your call as quickly asl possible so that you are not stuck looking at a car that you can’t get into. If you live in the Colton area and are in need of locksmith services, please get in touch with us today at Redlands Lock & Key. We are dedicated to providing fast, friendly, and professional locksmith services and we are certain that once you experience the level of professionalism that our locksmiths provide, you will never want to choose another company again. Contact us today and let us show you why we have, for 60 years, been a trusted name in the locksmith industry.